Before I get started, I wanted to thank those of you who have sent such sweet notes and IMs to me, even when you weren’t sure what was wrong. It’s too common in SL, and RL, to think that you’re alone and that people really aren’t noticing what’s going on. I already told my group, since they’re usually the first people I turn to, so I figured I better go ahead and say it here as much as I don’t want to do so. Levi has decided to leave SL because he needs to concentrate on RL things. RL will always always always come first and should always be the first priority. As sad as I am by this, I understand completely and have tried my hardest to make his departure as easy as possible. He is the best guy I’ve ever met in SL, and knowing that we’ll no longer be hanging out in SL talking and laughing has crushed me. But again, I understand why. I wish him absolutely nothing but luck, hope and happiness. So where does this leave me? To say that I’m a little lost and sad would be a bit of an understatement at this point. I do have things to take care of, and will be branching out into an area that I never thought that I would, but it’s hard for me to think I don’t have him to ask advice from anymore. Someone told me once, a long time ago, to “fake it until you make it.” That’s what I’ve been attempting to do in most of my public outings [well, all 4 times I’ve left the island so far], or on plurk. Just realize that although I may be laughing or looking like things are ok, they’re not ok just yet. I have faith that they will be again, though. I am keeping busy. I have signed on to be a helper at Starting Point. I’ve already made my plans to close the store, revamp things, make new things, and learn more about what I already know basics of. This Wednesday’s party will go on as planned, possibly at my home. 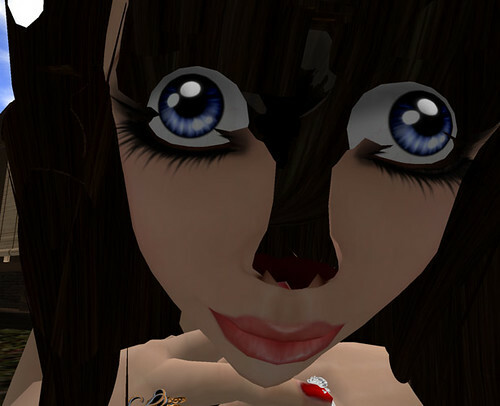 I do NOT – absolutely do NOT – plan on dating in SL for a long long long long long time. I just want to hang out with my friends. And…that’s pretty much the story. I don’t know how much more I’ll talk about it in this blog. Probably not much because I guess there’s not much more to say. Randomosity – Part…something – Even more pics. I didn’t have much to say today. I spent a lot of time tonight flitting around buying pieces of things here and there that I like for our home. Nothing that really went with anything. lol But since I don’t have much to say, and haven’t taken pictures of anything that I bought, I thought I’d just throw down some pictures that never made it to the blog. I forgot the site I used to make this picture, but I have it saved somewhere. This was one of the last days in our Orcas skybox, after we’d packed up and after the bed and tub were removed. It’s way sad. After I’d done a little decorating. Attack of the killer noob! Me floating in Laleeta’s balloon. The pictures I took at Inspire didn’t come out very well because for some reason I’m not catching prim glow on my pics. But someone floated by with all these sparklies and I caught a picture. We’d gone to get some hair and noticed a cluster of people in the sim. Turns out, it was a bot farm in the air above the store. There were more than this there, but I didn’t catch a pic after they’d all rezzed in. Non-rezzed sculpties can sometimes look dangerous. On our sonsaku tree before we logged for bed. Last night Levi and I had a date night. 🙂 Although we’re together a lot, and we live together, and we go out together, there’s just something special about a planned date night. We started out the night listening to Lovesmiley Gumshoe, who is a live performer, and a really great one in my opinion. Great voice! He does some original pieces and some cover songs, mostly Beatles. Kept us dancing for almost 2 hours!! 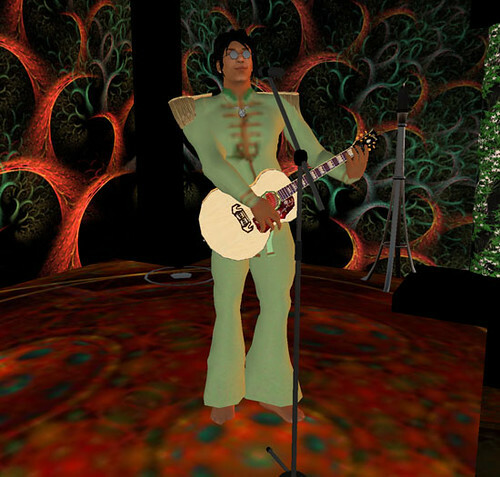 This was only the 2nd live performer I’ve ever seen in SL, and the first one wasn’t all that great. LOL So I really did have a ton of fun, and of course I love Beatles songs, even if he played ones that I didn’t really know. After the concert, we dressed up and went to a jazz club. I love old jazz, but I’m not a fan of smooth jazz, which is what this club played. But the funniest thing, and the thing that kept me distracted from the music was a guy named Sned. There were only couples at the club, and Sned. One lone woman was there, but when Sned made his way across the club to ask her to dance, she, in all caps, yelled out “I WAS JUST LEAVING.” That right there was enough to send me into a case of the giggles, to which Levi can verify since we were in voice at the time. So we decided to try to play matchmaker and Levi IMed Sned to tell him to hang around because I was going to see if I could get a girl to come dance with him. I IMed the Ch’Know group, but none of the girls seemed interested in poor ol’ Sned. 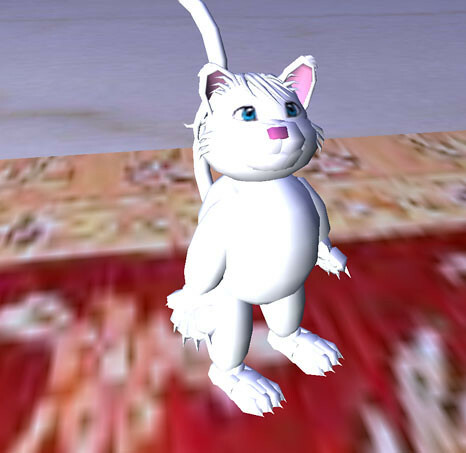 Which is just as well, since not finding anyone to dance with, he started playing with avatars and ended up looking like this. After that excitement, we hit up another jazz club, and this one was a heck of a lot better music-wise, and also had a great dance ball set up. Instead of just a bunch of balls all over the floor, there was a little ball you could touch to get the couples balls, and then touch it again to change dances. And we stayed there for a long time, listening to the music and dancing. 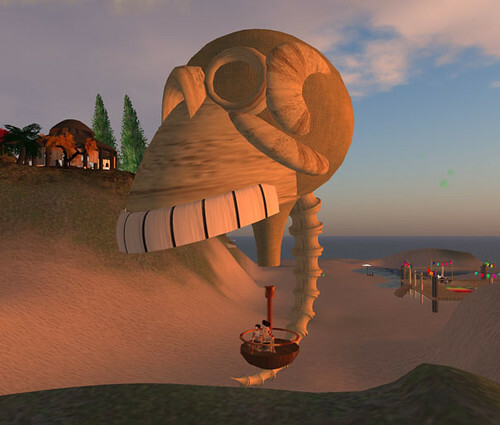 When we grew tired there, we sim hopped and ended up in this really serene and beautiful place called Heart of England. It was simply gorgeous. Trees and plants and very garden. What made us laugh was the music played. Oh, it wasn’t BAD music, not at all!! But it was like, movie soundtrack swelled with emotion oh my god is a dragon going to come eat us where are the white knights type music. Of course, by this time, I was starting to get sleepy. After changing out of our fancy clothes, we went in search of a store because we keep seeing things we like from one guy, but he doesn’t sell in SL anymore. We did end up in this really awesome sphere, though. It was all space like! We stayed there talking and talking until we got tired and ready to head to bed. All in all, it was a pretty great night. 🙂 Now today I am going to hit up a plants store. At the Heart of England, almost all of the trees and plants were by one designer, so I want to check out the store. There is still so much to do at our new place! A little chattier than I thought. I’m also now ready to change how my blog looks. Oh, not that it looks bad or anything. But the header I have is really suited more for summer. And of course I’m wondering which template won’t break the blog. lol I have a picture I’d like to use as a header but I have to resize to fit and all of that. This picture isn’t the one I’ll use for my new header, but it’s similar. And yes, I have been wearing dark hair lately. Not all the time, you’ll never get me to give up being a blonde. But for long straight styles, dark hair just works so much better. I’m sure the blondes out there will agree with me. There’s no gaping seam line around the head or in the ponytail with the dark hair. Someone said if I just set the hair to full bright, it won’t show up on the blonde hair. Yeah, but then my head looks radioactive. I might as well add prim glow and bling and call it a day. If ever a designer can work around that, AND make a decent blonde shade, AND not rely heavily on sculpties or alphas to do it, I will buy out their entire store. Even the hair I don’t like that much. 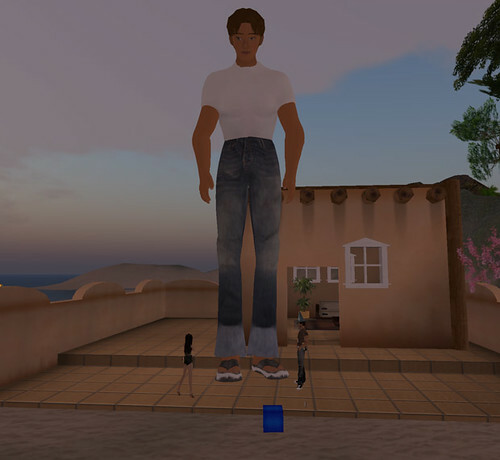 One of the funniest things from meeting with Gwendolyn was that she’s taller than me, and apparently when people meet me for the first time, if they are the “normal” SL height, they feel too tall. It’s always kind of funny to me when someone tells me that I’m SO short, or asks me if they’re just TOO tall. The answer is – I’m small. SL is built on a very large scale. Houses are usually large inside so you have room to move your camera. Furniture is made big. Couples poseballs are designed for a tall couple, not one of varying heights. As someone who has been short in SL from the beginning, I’ve learned how to compensate. I’ve learned to adjust prims, adjust poseballs, find furniture that fits. It doesn’t bug me much anymore, although it used to. But, I have been growing a bit lately. Oh, not much. According to my scale, I’ve grown 2 inches, from 5’6 to 5’8. In SL terms, that’s barely noticeable. Of course, then I put on my super high shoes and suddenly I’m 6’0 tall. For some reason, the shoes also added 27 pounds. And you wonder how I stay so thin walking around with weights like THAT on my feet. Levi and I hit up the Hair Fair last night, and after a crash, I now have to go back through my groaning inventory and find the demos and freebies I picked up, throw away the demos, try on the freebies, and throw away any bad ones. My inventory is becoming too massive. I’m inching up on 30k very quickly, if I haven’t passed it already and didn’t notice. But I really want to thank the hair designers that had decent mens hair out at the fair. It’s so hard to find hair that looks good for men, which is why I think a lot of them end up all wearing the exact same hair, or just go bald with the painted on hair. lol Poor men. If I ever learn to make hair, I promise to make you all some. Fabulous party tonight! Low key mostly, but totally fun. 🙂 Everyone had such great outfits!!! I didn’t get any pics, but you can see a few on Levi’s Snapzilla and I’m sure there will be others here and there on other blogs. 🙂 Jerremy did a great job of decorating, AND we had fireworks!!! It was awesome! I really need to stop plurking. I did a plurk yesterday showing this off, and never blogged it. Of course, I’ve been kind of walking around in a fog the past couple of days, so maybe that’s not surprising. Anyway, remember how I was in the process of building a gazebo for our hot tub, but I didn’t like what I’d built? Well, Aisuru IMed me and said that she’d like to build one for me. She had a new technique she wanted to try out, and this would give her the chance. Not being one to stand in the way of learning, I got way excited that I didn’t have to do it myself. lol Plus, she’s a great builder, so I knew whatever she’d come up with would be fabulous. I was totally right! 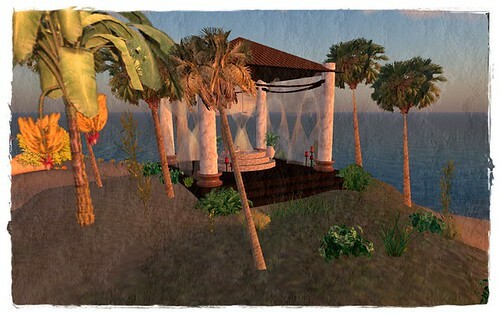 Yesterday she dropped the Moroccan Gazebo on me and it is just perfect, AND matches our beach furniture! Last night Levi and I thought and thought about where the perfect place would be to put it, and we decided that on a hill at the end of our land would be great, because we’d have nothing but a beautiful ocean view as we relaxed in the tub. The thin gauzy curtains are just so amazingly done. Don’t think I didn’t sit there and inspect and wonder “How the hell did she do that?” LOL We were looking at them wondering if they were alphas, but no, they’re not. It’s incredible. We set about putting trees and plants down, and I’ll probably put even more down later to give it a more lush feeling. I also put down the standing candles that had been given out in a group gift from Sai’s store, Imperial Elegance. [Btw, she’s having a half off gift card sale right now! You MUST go get some cards, either for yourself or for gifts. Remember, there’s only 113 days until Christmas!] The candles are color change, which totally rocks. They go so well with it all. I’d suggest clicking on the pics to go see them in Flickr, since I’m pretty sure Blogspot is going to cut them off. And I did a lot of fancying up with them just to try out PhotoScape. I couldn’t figure out ALL of PhotoScape, but it has some lovely filters, as you can see. So I had to go between Photoshop and Photoscape to get what I wanted. Big big big thank you to Aisuru for building that as a gift for us. We really love it!! Aisuru is the owner of Beloved Designs, and does some awesome sculpty work, so be sure you check out her store. It’s time for me to get busy throwing some songs together before tonight’s party, so I guess I’ll wrap this up. Oh, but before the night was over last night, we took a ride in this crazy skull balloon. LOL I knew there was one more thing I wanted to show. The weekend has officially come to an end tonight. It was a long weekend for a lot of people, so a long one for me by default. LOL It was an interesting one, that’s for sure. So many changes, moves, etc. But it was a wonderful one for me. I’m going to bed tonight feeling completely loved, and so happy. But I also go to bed with some worry. If you don’t read Cen’s blog or plurk, you are out of the loop. But I’m thinking of her and her dad right now, and they’ll definitely be in my prayers before I go to sleep. We decided to put a kind of beach/mountain house out. I LOVE this house, and it was so fun going shopping with Levi. I will admit to being highly picky, but as I’m finding out, he and I really do have similar tastes in decorating. After we bought it, and some furniture, we ran back home and he set it all up.